Now that you're familiar with your trading account interface, let's go ahead and execute your first stock purchase. We will buy 100 shares of a well-known American corporation, Wal-Mart Stores Inc (NYSE: WMT), using the following steps. 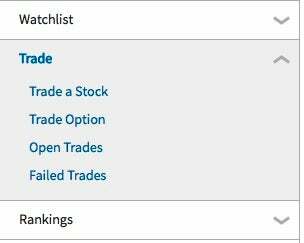 After logging into your Simulator account, click on the "Trade" tab near the side of the screen. Take a minute to review the details of your order. As you can see, you are buying 100 shares of WMT at its market price. 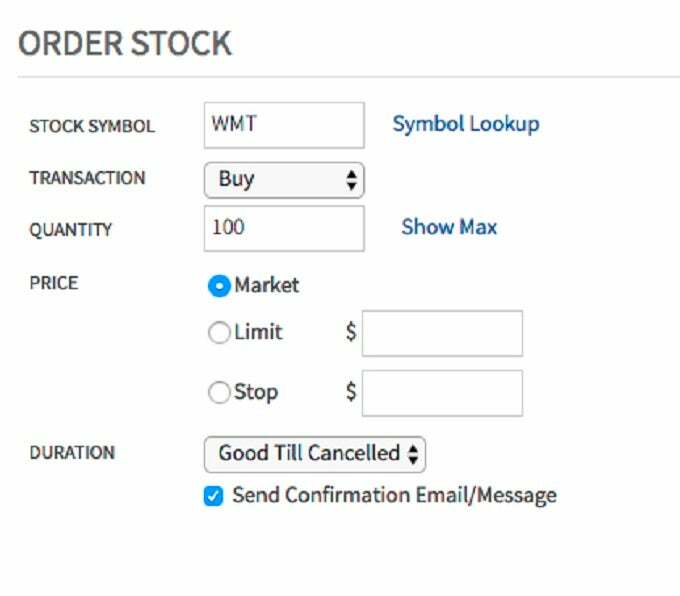 Your transaction type is Buy Market Order (Buy MO), which means you want to buy shares of WMT at the current market price. In order to simulate a real online trade, your play money account will be "charged" a commission of $19.99 per trade. Brokerage firms commonly charge commissions for the service of executing trades. Click on Submit Order button to confirm your purchase of 100 WMT shares. Your order is now confirmed and will be filled at the first available opportunity. Please note that if you have made your order outside normal market hours (9:30 am – 4:00 pm Eastern Time), your order will be filled at the start of the next trading day. If you place the order during regular business hours, you'll see WMT in your portfolio within 20 minutes. To learn more about why there is a 20-minute delay, click here. After submitting your order, you'll see a page that confirms that your orders has been successfully accepted by the stock simulator. Furthermore, the stock simulator will also show you the 5 stocks that currently have the biggest gains and biggest losses in the market. This information can be a good jumping off point for other stocks to trade! Now that you've purchased your first stock, let's review the details of your holdings in the next section. This day trading tutorial covers general principles, deciding when to buy and sell, common day trading strategies and how to limit losses.